A stopgap vinyl/digital release before an upcoming album apparently due later in 2017, I missed Takitum Tootem! when it was released late in December, but it’s definitely worth taking the time to catch up on. 2013’s Blood Vaults was a bit of a hit and miss record with me at least, although it was widely praised elsewhere, so it’s going to be interesting to see people’s reactions to this, not least because it’s batshit insane! The opening Takitum Tootem! (Wardance) is an eight-minute invocation, that bracketed word making me think of Killing Joke’s hypnotic rhythms, and indeed you can hear an echo of inspiration behind this. It opens with eerie, distorted horns and percussion that comes dangerously close to sounding amateurish, before tribal percussion and fuzzily grinding guitar lines create a soundscape for von Meilenwald’s growls and the almost monklike chanting he uses in place of clean vocals. It’s quite gripping, particularly when the backing screams and howls start cropping up; a truly hellish ambience. Perhaps the different vocal effects towards the end go a little over the top, but it’s a small criticism, and if the label’s website are correct in describing this as “the initial part of a bipartite meditation and celebration in euphoria for manhood's loss of the crown of creation” then I honestly can’t wait for the second part. The b-side is taken up by a remarkably good cover of Pink Floyd’s Set the Controls for the Heart of the Sun, avoiding the tribal overload of the title track in favour of a dignified and restrained performance by von Meilenwald. It keeps the classic melody of the song and builds on it with percussion and carefully-placed electronic effects, building intensity with the addition of Eastern melodies and then devolving into ambience, restarting the song then finally closing on the weird distorted horns that opened the EP. Hearing this helps you understand a little what the first song was aiming for, and it’s hard not to just listen to on repeat. 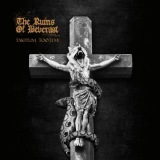 The Ruins of Beverast is always a fascinating project even if the music doesn’t quite succeed, and those already in love with the band will find this a challenging yet interesting direction for von Meilenwald. Let’s hope the forthcoming album doesn’t go too far down this path, however. You can hear and buy the EP from the Bandcamp link above.